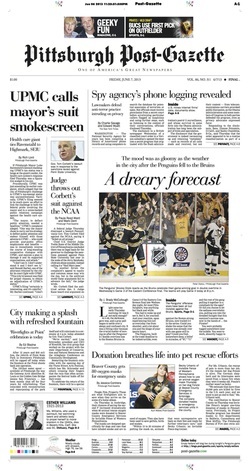 This front page story was published during my first week at the Post-Gazette. People. Pets. Property. Those are what firefighters aim to save when they arrive on the scene of a home ablaze. On Thursday in Ambridge, their chances of saving the second P increased dramatically when 80 animal rescue oxygen masks were donated to Beaver County Emergency Services by Invisible Fence of Western Pennsylvania. The masks are designed specifically for dogs and cats that have inhaled smoke and are in need of oxygen. They also have been used to save gerbils, birds and snakes. "Within 15 to 20 minutes of putting the mask on, animals that were unresponsive are back on their feet and ready for further veterinary care," said Becky Urbanic, an Invisible Fence dog trainer. For Ms. Urbanic, the rescue of pets is more than her job; it's the reason her dog Fonzie is alive. The German shepherd and its littermates were saved from a house fire when they were 8 weeks old. Fonzie's mother wasn't as lucky. "We estimate that more than 40,000 pets are killed by fires in the U.S. each year, and we want to put an end to that," Ms. Urbanic said. The contribution to Beaver County on Thursday was Invisible Fence's largest one-time donation of masks in Pennsylvania. Previously, its Project Breathe program has donated masks to fire departments in Baldwin, Canonsburg and West Mifflin. The Pittsburgh Bureau of Fire also owns animal oxygen masks, although they were not donated. Randy Dawson, supervisor of the Beaver County 911 Center, said he's relieved his team finally has the proper tools to help pets in danger. "Before, we really had to improvise to try and save the animal," Mr. Dawson said. "We would use masks sized for infants or stick the oxygen tube directly into the animal's mouth. This is going to be far more effective." During a training session Thursday for emergency responders on how to use the masks, Tony Amadio, chairman of the Beaver County commissioners, expressed his appreciation to Project Breathe. At $120 per kit, the 80 masks represented a $9,600 contribution. "Luckily, we've always had the equipment to take care of the people in fires, but now we have the tools to handle what is often their most promised investment: their pets," Mr. Amadio said. Officials emphasize that it's important to remember that saving human lives always comes first. "But these days, so many people treat their pets like family," Harmony firefighter Larry Guidry said. "That's why it's always important to try to save the animals, too." Any Beaver County emergency response team that was unable to attend Thursday's training should contact the emergency services department to arrange to pick up a mask kit. "Hopefully, we're never going to have to use these things," said Ed Clark, emergency agriculture coordinator. "But when the time comes, now we're ready."